President Barack Obama has assured us that we need not be worried about the National Security Agency listening to our phone calls or monitoring our Internet use. The NSA’s programs, he said, represent “modest encroachments on privacy” that are “worth us doing” to protect the country from terrorists. Count me among those who are not reassured by Obama’s statement. I know better—from my schoolboy knowledge of the Constitution and from my own experience during the '60s with unwarranted government surveillance. I don’t usually like to base moral judgments on what the Constitution does or does not allow, but in this case, it makes sense to do so. The Constitution had two very different purposes: One was to create a functioning government; the other, forged in the wake of the American revolution, was to establish constraints that would prevent the abuse of state power. The First Amendment was designed to do the latter; and so was the Fourth, which prohibits “unreasonable searches and seizures.” The administration’s obsessive pursuit of press leaks threatens the First Amendment’s freedom of the press; and the NSA’s surveillance violates the Fourth Amendment’s ban on general warrants—on indiscriminate searches without probable cause. The administration claims that these actions were approved by Congress and authorized by the courts. But I am not impressed that some senators and judges approved these efforts. American history is littered with bad decisions from narrowed minded, short-sighted legislators and jurists. I’ll take my stand with senators Wyden, Udall, Durbin, and Paul on these issues rather than with Senator Lindsay Graham or Roger Vinson, the judge who signed off on the NSA’s surveillance and who also ruled that the Affordable Care Act was unconstitutional. One reason that I am particularly angry about what the administration has done is that I’ve seen it all before. In the wake of the Cold War, both the Federal Bureau of Investigation and Central Intelligence Agency acquired tremendous power to investigate and deter what Washington believed was political subversion. There was little oversight of either agency. In the late '40s and '50s, the FBI identified and monitored domestic Communists, whom its director J. Edgar Hoover believed to be under every bed sheet, while the CIA operated abroad. Then, in the 1960s, both agencies turned their considerable power and attention to the domestic threat to official Washington posed by opponents of the Vietnam War. Some of what they looked at it was genuine criminal activity—people planting bombs or kidnapping newspaper heiresses—but most of it had nothing to do with criminal activity or with any foreign directed subversion. It simply consisted of determined dissent from what the Johnson and Nixon administrations were doing. A photo of the author from his FBI file. Take my own case. I was a politically active radical and socialist during much of the '60s and the first half of the '70s. I got started in the civil rights and anti-war movements; I was a member of Students for a Democratic Society, although in northern California that didn’t mean much. 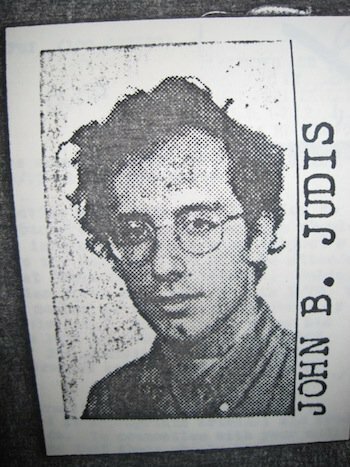 I was an editor of a theoretical journal euphemistically titled Socialist Revolution (at a time when the real hardliners described themselves as small-c communists), and I was a leader of a nationwide socialist organization called the New American Movement, which tried to pick up where the less crazy parts of SDS left off. I had my own vague vision of what a socialist America would look like, but almost everything that I did was directed at immediate issues like ending the Vietnam War or later impeaching Richard Nixon. I was not a bomb thrower. I advocated running candidates in elections. I taught classes on Marx’s Capital and American history at a school we organized in Oakland. But during this period, I was under almost constant surveillance by the FBI and by other intelligence or police agencies. I received regular visits from the FBI (I told them I wouldn’t talk to them), and they also visited my parents and friends. Another document from the author's FBI file. 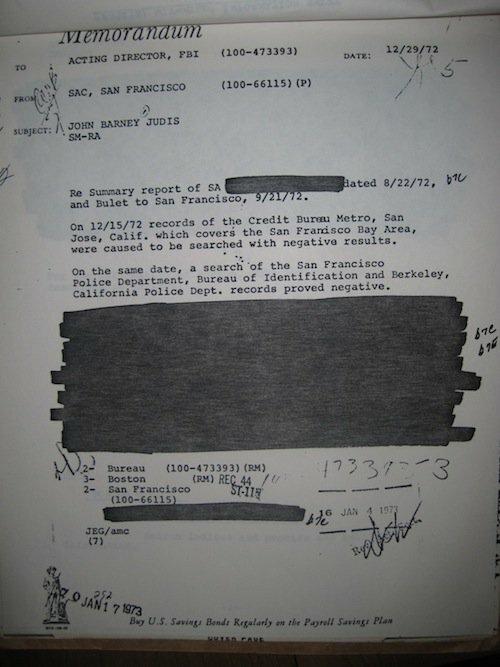 As my FBI file, which I later obtained, attested, my movements were being monitored even when I didn’t know it. (Most of it is, unfortunately, blacked out.) In organizing demonstrations, I encountered people who turned out to be government agents. I was pulled over by the police with guns drawn for no apparent reason. And I also received inquiries about my tax returns from the IRS even though I was living on about $3000 a year during much of this period. These inquiries, which to this day may or may not have had something to do with my politics, certainly make me sympathetic to the rightwing groups who were barraged by inquiries from the IRS—whether or not these inquiries were directed by higher-ups in the administration. There were, obviously, people who were subject to far greater harassment than I was, and who played a much greater role in the new left. But that’s what makes my case interesting. I can pretty safely say that there was no good reason to put me under surveillance. After the Watergate scandal, Congress finally recognized that the FBI and CIA had widely overstepped their Constitutional bounds. In 1978, Congress passed the Foreign Intelligence Surveillance Act. It was supposed to limit agency surveillance to people whom the agency suspected, on sufficient grounds to convince a judge, were actually agents of a foreign power. The government agencies weren’t supposed to fool with anybody else. But 35 years later, we learn a government agency has been empowered to monitor all of us all the time. That indiscriminate power, like the power that the CIA and FBI held after World War II, can be directed against domestic dissent. Obama says that the debate over the NSA’s activities is “healthy for our democracy” and a “sign of maturity.” But I think it’s a sign of forgetfulness—of Constitutional amnesia—on the part of Obama and his Attorney General Eric Holder, not to mention the administration’s vaunted intelligence chiefs who want to divert attention from the subject of the leaks, which is their own behavior, onto the leaker. I am hoping Democrats as well as Republicans in Congress remind the administration what the Constitution was designed to do and what the original FISA legislation was meant to do, but judging from the performance of most congressional leaders so far, I am not holding my breath.